Literally the first movie I ever saw in a movie theatre-and I remember it! Luckily for me, my mom was a big horror fan also. I( was like 2, btw). Anyway, love this movie for the way an everyday object is turned into a device of horror and murder. Not only an everyday object but a really hot car. So this has put several favorites together into one wonderful package-including 50’s tracks that I greatly appreciate and find haunting. If you read the book, Stephen King incorporates many more songs and this story evokes the short, “The Mangler”. I think this is one of the few books by King that wasn’t destroyed and made totally unwatchable when interpreted into a film. In short…Boy finds car, boy falls in love with car not knowing it killed it’s previous owner and his family, boy tinkers with car but car restores itself, car enslaves boy, makes him cool and then kills his enemies and anyone that stands between them in various car-ways. 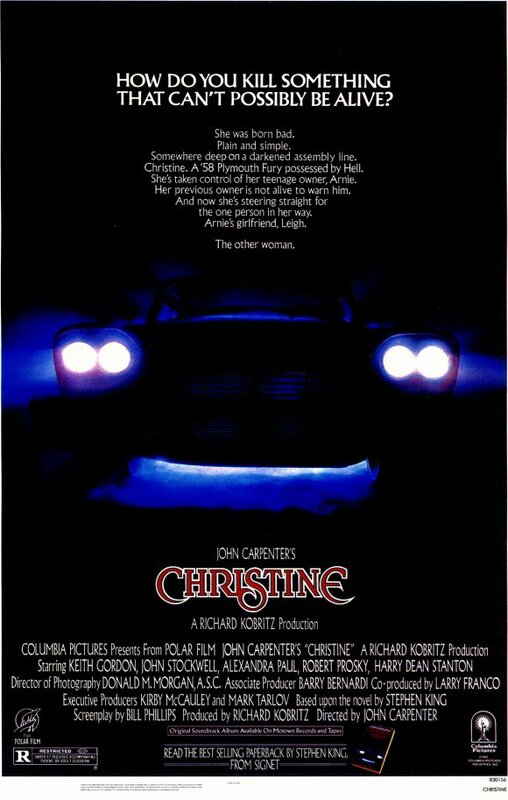 Christine is set in 1978 and between the gritty 1970’s ambiance (cars, music, fashion) and 1950’s thrown in there-the Plymouth and music-makes for an interesting blend of thought evoking nostalgia. The ending for this movie kind of didn’t make sense-if the car could regenerate and fix itself, what sense would it make to crush it up? Would you have to smelt it like in T2? Idk. The book touches on the car coming back in the end and returning to kill off its remaining enemies-something the movie does in a minor way after the crusher scene in the junkyard with the twitching of that broken piece of chrome…gives you a hint that the story is not over there. Glad they didn’t kill that idea with a sequel.